Stepping into the west entrance of Donjiaominxiang, it’s hard to connect this place with the word hutong. Common hutongs are narrow, with little vegetation but many restaurants and stores. Here, however, it’s so wide as to be a proper, tree-lined road. 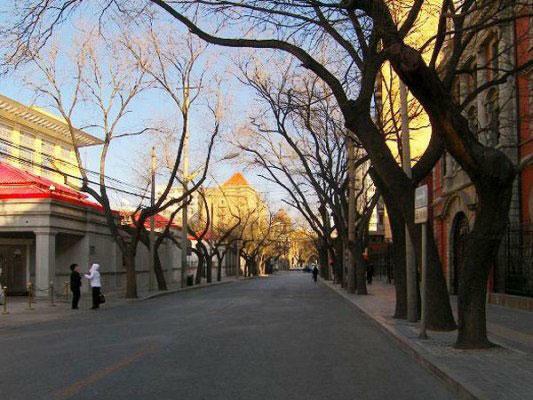 Dongjiaominxiang is often called the longest hutong in Beijing, stretching 1.5 kilometers from west to east. Walking slowly and distractedly, it can take two hours to stroll the length of the street, so bicycles are advised for those who want to reduce their time spent moseying. Century-old, western-style buildings conspicuously stand out between newer, imposing government offices. Dongjiaominxiang served as Beijing’s diplomatic center for over 700 years, since the Yuan Dynasty. The area accommodated a series of foreign dignitaries, most notably Marco Polo, who mentioned the lane several times in his book of travels. In 1900, the 55-day battle that took place between the Boxers, who wished to purge the city of foreign influences, and foreign delegates who barricaded themselves in the Legation, ended with the arrival of assistance from the Eight-Nation Alliance. The following Treaty of Xinchou (the International Protocol of 1901), designated Dongjiaominxiang as an embassy zone protected by walls 6 meters tall. Chinese were not allowed to come near, which was considered a particular humiliation at that time. Even the roads around the embassies, which previously were collectively labeled as Dongjiangmixiang, were referred to by their English names. After the establishment of the People’s Republic of China, the area continued to serve as an embassy zone, with many new diplomatic buildings constructed. Some of the original structures have been well preserved and re-purposed, such as the former Japanese embassy (now the Beijing Municipal People’s Government building), the Germany embassy (now a general clothing store) and the Italian embassy (now the Foreign Friendship Association, which serves to build international bridges of communication and cooperation). Other non-diplomatic buildings on the street continue to betray the foreign influence behind their structures. You may take a look at some Beijing tours we provide. This entry was posted in Chinese Culture, Travel and tagged Beijing, culture, Hutong. Bookmark the permalink.